Richard Sennett, author of the magisterial sociological text The Fall of Public Man, has always been interested in the way that relationships are mediated through the changing contours of cultural exchanges. In Together: The Rituals, Pleasures and Politics of Cooperation, Sennett embarks on a fresh exploration of one of the oldest conundrums facing social theory, which is how cooperation between people is forged and maintained. A long time before Georg Simmel asked ‘how is society possible?’, philosophers and scholars tried to discover the secret of cooperation. In the 18th century, Bernard Mandeville and Adam Smith took the view that pursuit of self-interest led to cooperation. A century later, Karl Marx enthused about how cooperation expressed the creation of a new force, ‘the collective power of masses’. Since the late 19th century, social theorists have been more concerned with addressing the problem of the absence or decline of cooperation, rather than its presence. At a time when society is often diagnosed as selfish and greedy, it is increasingly difficult to be enthusiastic about the potential for cooperation. In line with contemporary experience, Sennett is sensitive to the difficulty that contemporary society has in giving meaning to cooperation. Through presenting the reader with a series of contrasting vignettes between the past and the present, Sennett leaves us in no doubt about the erosion of society’s capacity to cooperate. ‘We are losing the skills of cooperation needed to make a complex society work,’ he warns. Historical experience shows that cooperation thrives through the deepening of informal links between people. The flourishing of cooperation is paralleled by the growth of taken-for-granted habits and attitudes. Although validated through the force of custom, real cooperation always retains a voluntary and subjective dimension. It also requires trust. Simmel describes mutual trust as ‘both less and more than knowledge’. It is on the basis of learned expectations that people feel empowered to trust and are prepared to make the leap of faith required for cooperation. Although Sennett deals with a range of symptoms of the current fragility of cooperation, his most significant contribution is his attempt to draw attention to the difficulty that people have in forging and sustaining informal relationships in contemporary society. 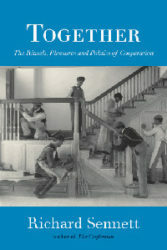 In his study of working-class families in Boston in the 1970s – published in 1972 in The Hidden Injuries of Class, co-authored with Jonathan Cobb – Sennett found that one of the most important cultural resources that manual workers had at their disposal was the informal ties they had created. These allowed the workers that Sennett interviewed to deal with their alienation, the demands of their work and their employers. These informal networks also helped consolidate ‘mutual respect and cooperation during a crisis’. The positive contribution that informality can make to the life of a community is particularly evident in an emergency. In an unexpected crisis, the formal rules and ways of doing things often prove to be inadequate for the new circumstances. Research carried out on how communities respond to a disaster indicates that informal networks are far more flexible than formal institutions in handling the situation. Sennett writes that ‘moments of crisis’ reveal the ‘fragility of formal organization and correspondingly the strength of informal collaboration’. When Sennett interviewed former white-collar workers on Wall Street, 40 years after his Boston study, he found that a very different dynamic prevailed. The bonds of informality were conspicuously feeble. Together does not quite provide a convincing account that explains the demise of informality, but it gives a compelling account of its consequences. The book argues that informality can flourish only when it is underpinned by long-established and durable institutions. Pointing to the reorganisation of capitalism since the early 1980s, the author contends that with the shake-out of industry, the rise of part-time work and the loss of shared time, ‘people’s experience of one another and knowledge of their institutions has shortened’. Explanations that rely on structural innovation to account for the decline of cooperation no doubt had an influence on undermining informality. But organisational instability need not undermine cooperation. Industrial instability, punctured by periods of unemployment, coexisted with a robust culture of informal cooperation in many working-class communities in the 19th and early 20th centuries. What corrodes informality may well be cultural influences that are hostile to its existence. Sennett develops a more promising line of enquiry when he reflects on the distinction made by the financier George Soros between a momentary ‘transaction’ and sustained ‘relationships’, and how the latter has been displaced by the former. When relationships are displaced by an ethos of transaction, it fosters a culture that explicitly devalues the role of informality. The clearest manifestation of the displacement of relationships by transactions has been the rise of process. The juridification of different areas of social experience means that people are left with little discretion to make their way. They are expected to follow procedure rather than cooperate. The expansion of process through codes of conduct leads not only to the micromanagement of behaviour, but also to the stigmatisation of informal networks. Terms such as ‘peer culture’, ‘canteen culture’ or ‘old boy network’ are morally devalued and invariably treated as something to be banned or regulated. Yet back in 1970s Boston, such networks constituted some of the most significant informal networks through which cooperation gained definition. Today, informality and spontaneous behaviour are often regarded as a potential breach of contract by human resources departments. This formalisation of relationships is not a by-product of overzealous managerialism, but a symptom of society’s estrangement from the uncertainties associated with informality. Sennett rightly observes that ‘formality favours authority and seeks to prevent surprise’. Informal relations are by definition fluid and unpredictable. Precisely because such relations involve an element of give and take, their pursuit could lead to unpredictable outcomes. The reason why Sennett’s Boston workers cultivated relations of cooperation is because, through that interactive dynamic, they gained a measure of self-respect and a glimmer of agency. One insidious manifestation of formalisation is that it seeks to bind informal relations to its own logic. Through colonising people’s life world, the managerial imperative empties informality of content and then recycles it as a tool of management. In numerous organisations, a managerial variant of cooperation is encouraged through orchestrating ‘teamwork’. In some cases, teamwork is imposed on otherwise isolated individuals. Is it any surprise that business schools and consultants offer coaching in ‘how to display cooperativeness as a team player’? It appears that the more that real cooperation declines, the more people are exhorted to perform their role as ‘team players’. ‘Short-term teamwork, with its feigned solidarity, its superficial knowledge of others,’ notes Sennett, represents the very opposite of cooperation. So can something be done to restore informal trust relations and foster a climate in which cooperation can thrive? Sennett does not accept that the situation cannot be reversed. He is aware that there are no simple solutions to this problem. He sees the ‘de-skilling’ of people in the practice of cooperation as constituting the central obstacle to overcome. The problem that confronts us is that a skill required for the conduct of human relations – such as cooperation – needs to be learned but cannot be taught. We have a long journey ahead of us, and Sennett reminds us that we had better start practising it.